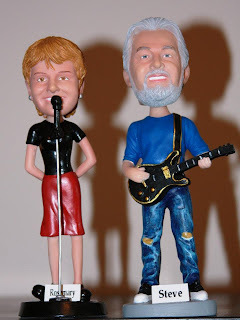 My husband was surprised and delighted to receive these cute bobblehead versions of us. He plays the guitar, and although I'm no singer, in this case it seemed only appropriate that I get behind the microphone to accompany him. I ordered these online from Face It Figures, and I was quite pleased with the service. You can find several other companies who make these by doing a Google search on "personalized bobbleheads". There are many different body types available to suit whatever profession, hobby or fantasy you may have. Be aware that you will need to get started 6 to 8 weeks before the gift-giving occasion. You will need good, clear pictures of each person's face in full front and profile poses. Bobbleheads always make people smile, and they are great conversation starters. An individual doll is a fun gift for any occasion, and a pair would be perfect for an engagement, wedding or anniversary. My hubby liked these so much that he posted photos on Facebook and used his as his profile picture.